If you love chocolate-covered cherries, you've gotta try this recipe! Cherry marshmallows, packed with cherry flavor and lots of chopped maraschino cherries, are given a dunk in chocolate before serving. They're a fun departure from typical Vanilla Marshmallows, and are perfect for gourmet s'mores or gift-giving. Looking for other fruity marshmallow recipes? 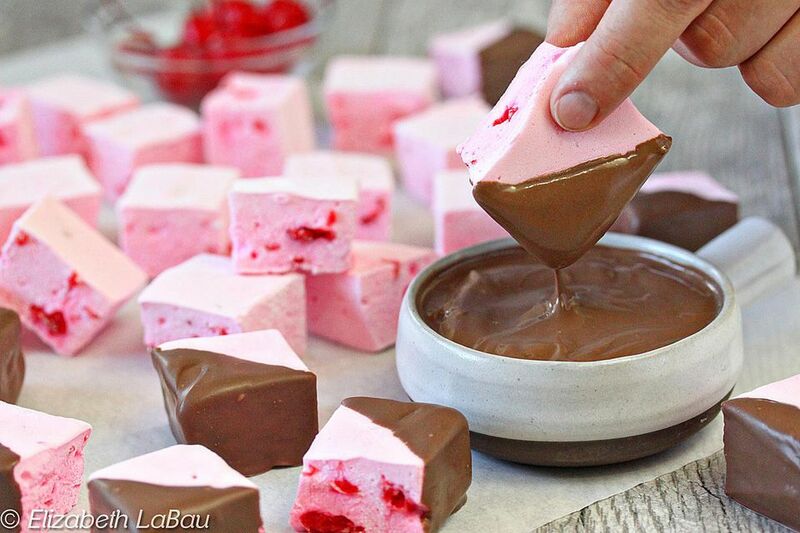 Try making Strawberry, Lemon, Mango, Raspberry, or Orange Marshmallows! About 30 minutes before making the marshmallows, finely chop the maraschino cherries. Place them between thick layers of paper towel, and press well to remove as much moisture as possible. Let them sit for about 30 minutes to dry out (longer is okay.) Having moist cherries will make your marshmallows gooey, so try to get as much liquid out as possible. Line a 9x13-inch baking pan with cling wrap, extending up and over the sides. If your roll of cling wrap isn't wide enough, overlap two strips of plastic wrap. Spray the inside with nonstick cooking spray. Once all of the syrup is added to the whites, gradually increase the speed of the mixer until it is running on medium-high speed. Whip the marshmallow until it is very thick, shiny, and opaque, about 8-10 minutes depending on your mixer. When you lift the whisk from the marshmallow, it should slowly stream from the whisk in a thick ribbon. Add 2 tsp cherry extract and a few drops of pink food coloring, and mix them in well. Taste the marshmallow, and add additional cherry flavoring, if desired, until you get a nice strong cherry flavor. Add the chopped cherries, and stir them in. Pour the marshmallow into the prepared pan and smooth it into an even layer. Let the marshmallow sit and rest, undisturbed, at room temperature until it is completely set, about 8 hours. When you're ready to cut the marshmallow, dust your work surface with powdered sugar, and sprinkle a layer of powdered sugar on top of the marshmallow. Flip the marshmallow face-down on the work surface and peel the foil or cling wrap off the back. Dust a large chef's knife with powdered sugar and cut the marshmallow into long thin strips, cleaning the knife frequently as it gets sticky. Cut the strips of marshmallow into small squares. Toss the marshmallows squares in powdered sugar to prevent them from sticking together. Dust off as much excess powdered sugar as possible. Place the chocolate coating in a microwave-safe bowl, and microwave until melted, stirring after every 30 seconds to prevent overheating. Cover several baking sheets with parchment or waxed paper. Hold a marshmallow by the corner, and dip half of it in the melted chocolate. (If you prefer, you can dip the whole thing in chocolate!) Put it on a baking sheet, and repeat with the rest of the marshmallows. Refrigerate the trays briefly to set the chocolate, for about 15 minutes. Once set, you can store the marshmallows in an airtight container at room temperature for up to two weeks.